Heat oven to 425°F. Spray 18x13-inch rimmed sheet pan with cooking spray. In large bowl, mix 2 tablespoons of the melted butter, 1/2 teaspoon of the curry powder, 1/4 teaspoon of the salt and 1/4 teaspoon of the pepper. Add potatoes and bell pepper; toss to coat. Place in single layer in pan. Roast 16 to 18 minutes or until just tender when pierced with knife. Remove from oven; stir. In same large bowl, mix remaining 2 tablespoons melted butter, 1/2 teaspoon curry powder, 1/2 teaspoon salt and 1/4 teaspoon pepper. Add chicken to mixture; toss to coat. Arrange in single layer in pan next to vegetables. Roast 20 to 25 minutes longer or until juice of chicken is clear when center of thickest part is cut (at least 165°F) and potatoes and peppers are browned and very tender. Add chick peas and peas to pan. Roast 4 to 6 minutes longer or until chick peas and peas are hot. Top with cilantro. Not all curry powder is the same. Most contain coriander, turmeric, cumin, fenugreek and chili peppers, but are relatively mild. Hot varieties are available as well. For testing this recipe, we used a mild curry powder. Chicken breasts come in many different sizes. 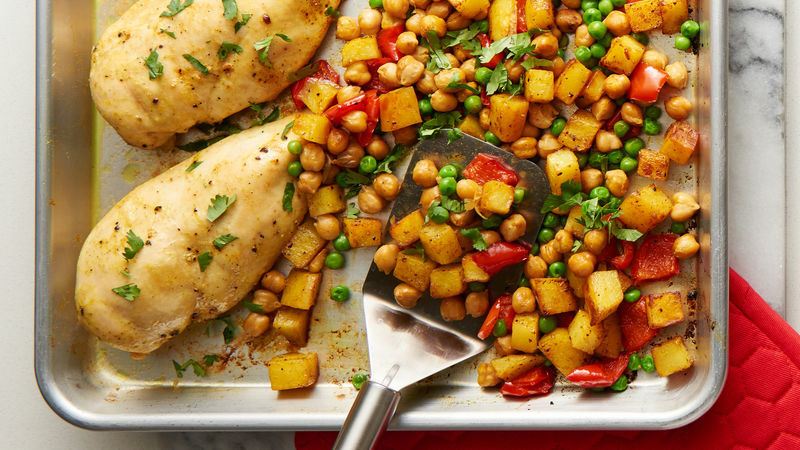 For sheet-pan cooking, it’s important that they are all about the same size. If yours are very small or very large, adjust roasting time accordingly.